Point Shot: A Less Than Ideal Start for the Penguins - The Point Data-driven hockey storytelling that gets right to the point. The Pittsburgh Penguins are 1-1 after two games, beating the Capitals 7-6 and then falling to the Montreal Canadiens 5-1. 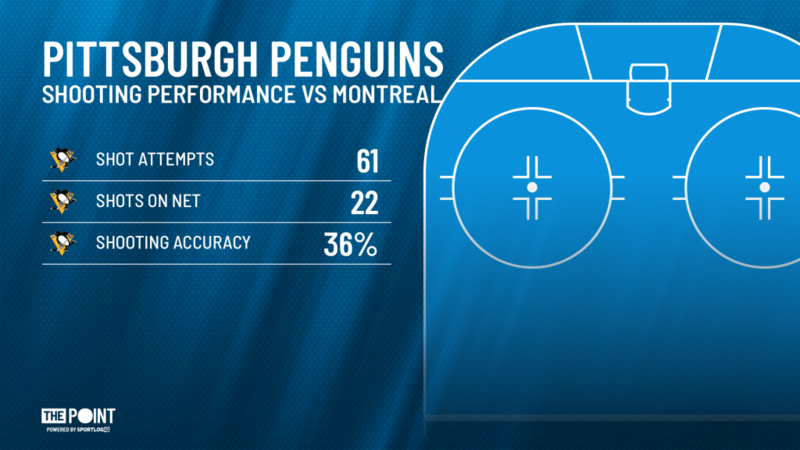 Despite a win, Pittsburgh’s performance hasn’t been very encouraging. They have now allowed 11 goals in only two games and have overall been very suspect defensively. They usually have the offense to cover up their defensive shortcomings, but last night’s game against the Canadiens was a perfect example of what happens when the offense falls flat. 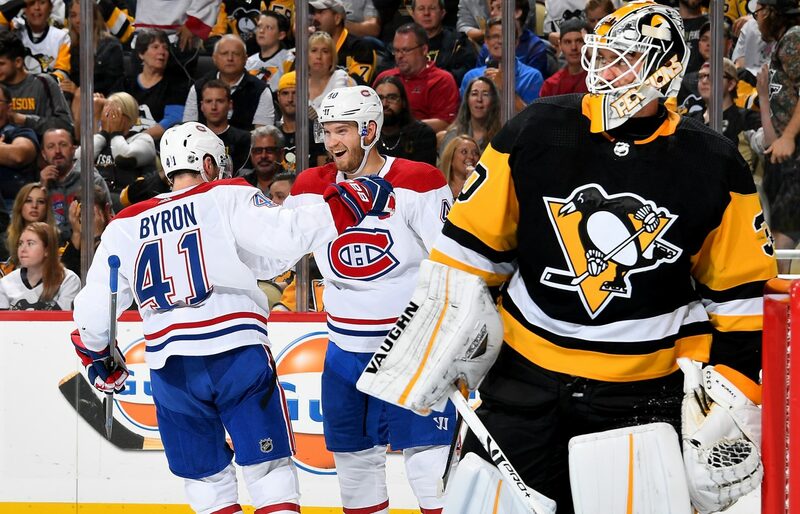 The Penguins had all sorts of trouble hitting the net last night, with Montreal blocking 18 shots, nearly as many as the Pens managed to put on net despite Pittsburgh trailing for most of the game. Their only goal came late in the second period when the game was pretty much out of hand already. 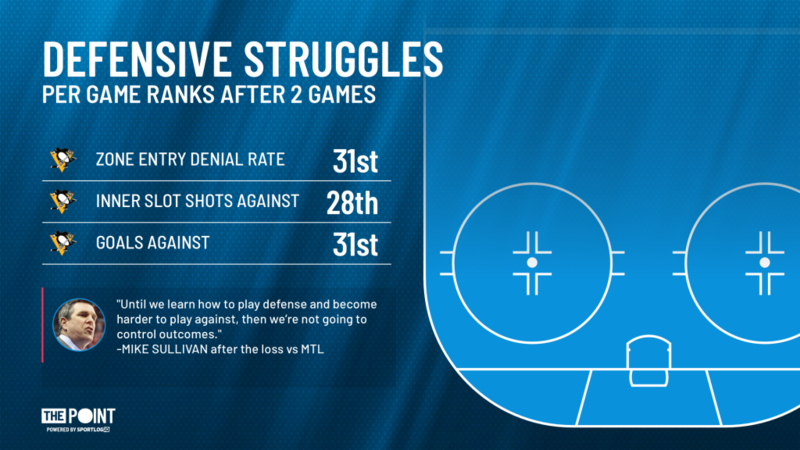 The lack of offense made their defensive struggles impossible to ignore, something that head coach Mike Sullivan mentioned in his post-game press conference. “We’re a team right now that just wants to score”, said Sullivan, “instead of just playing the game the right way and playing on both sides of the puck.” When looking at the numbers, it’s easy to see why Sullivan is unhappy with the performance of his troops. The first two games obviously won’t make or break the Penguins’ season and they should still be considered among the elite of the league. However, if Sullivan’s team can’t tighten up defensively, it will add a lot of pressure on Matt Murray, especially on nights like yesterday when the offense can’t get going.